Arthur: " I wish that she would get on with it"
Martha: "That's just what I was thinking - why use 570 words if 3 will do...."
This large and heavy object lives on our dining room table - dates from 1900s, has lovely coloured tiles (a bit bashed but hey!) and inlaid with little pewter hearts peppered around the edge. Arthur: "Yes - but WHAT IS IT?" 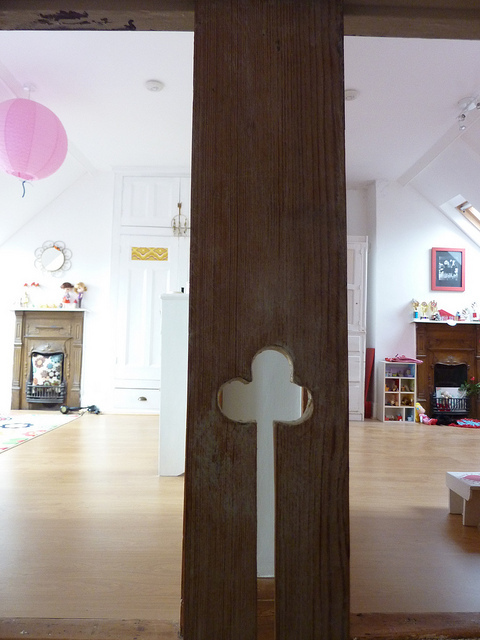 I remember someone asked on this blog if it was a pulpit seen in our dining room......! Sorry I cannot recall who asked that but it is not a pulpit but an Edwardian cloak cupboard (must be a proper name). We bought this from a shop in Crystal Palace about 25 years ago (not sure why I find it important to tell you those sort of details) - the partition on top is for hats and there are hooks in the main part for cloaks/coats. Also not sure why but it has lived in our dining rooms and I just like looking at it! Mirror lives above the Arts and Crafts seat that I garbled on about previously. Dear Hattatt when that moment of the 'Great Downsize' arrives - as it surely one day will - I will let you know and you will be most welcome to this lovely piece. I very much like the idea of things going to appreciative homes. ...and yes I do 'force' guests to use the jug and bowl for washing purposes - cold water at that (ha ha) !!!! 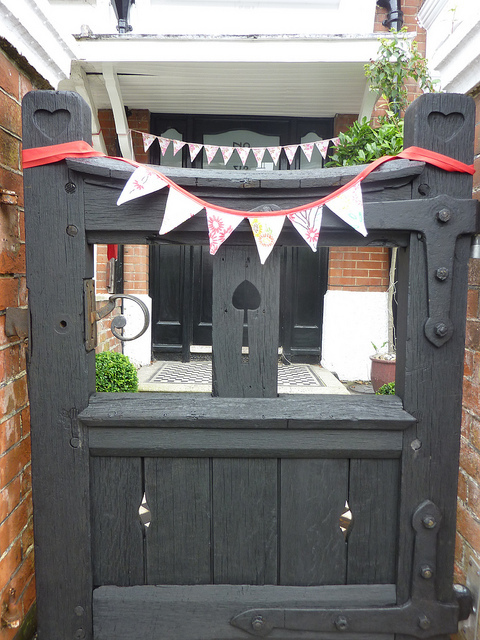 I was about to post this post and realised that I had forgotten about another favoured heart item - our front gate!!! I have mentioned our gate before but I do not think I posted 'before' pictures. It cheers me up when I go through it (sad but true) and I like leaning over it to chat to my neighbours -even the postman tells me how he likes our gate. FINALLY - and this is possibly my favourite heart item - our 1900s copper umbrella stand (I bought this from a shop off Chapel Street Market (London) again 25 years ago. It also sits by the front door (other side) and I love it greatly. It is quite beaten up but I love how it has been made from a single sheet of copper - curved round and riveted back onto itself and there, on both 'sides', is a repoussé heart. I have always liked the combination of copper with oak and will write more about copper 'bits' another time..
Arthur: "You are boring the pants off me"
For now that's it from the 'Hearts and Crafts Movement' !!! PS - Contrary to any impression that I may convey we do not live in a museum!!!!!!!!!!!!!! You do have a way with words Jenny! I think you must live in a tardis to fit everything in! We cannot possibly wait for you to 'Downsize' for we are certain that either it will never happen [why would you leave such a wonderful house?] or, even more likely, we shall long be in our graves. We want it ALL, and we want it NOW!!! These are absolutely the most marvellous items with which to surround yourselves and to enjoy in your daily lives. You are true collectors simply for, we suspect, the love of beautiful things, and everything from the garden gate, and superb tiled path onwards, is evidence of this as well as being a complete and total joy. Thank you so much for the link to our own blog. We thought this to be so kind and it is very much appreciated. Oh dear - I cannot consider your demise!! I am flattered indeed that you should like these bits and bobs - I fear that I inflate some of these things....selective photographs as always. I do not show the toilet roll for example! Love the gate and the fact that so much hard work and love went into restoring it. Many of your items remind me of the work of Charles Rennie Macintosh, especially the copper umbrella stand. Love this post. Will be busy making heart shaped items this afternoon for a friend's charity event next week. This post has given me new enthusiasm for the project! Word-wise, I think its great that HEART is an anagram of EARTH. how many other nutty, spirited housewives have leaned oever that chatting, I wonder? I do like a natter you know! I think I've realised finally why I like your blog so much...my grandpa was a carpenter and my gran a maid in her younger years, both country folk. Their taste and life were so simple, it was reflected in their home, simple. practical yet stylish. Gran was a housekeeper for more years than I've had on earth for a family who had the most lovely arts & crafts house and I think it's the memory of all the carvings, furniture and fabrics that I remember from my summer holiday days spent there that are similarly reflected through your photos. Oh Nicky that is lovely - thank you for sharing that. That type of story is the glue that keeps us together I think. I wish I was a carpenter - I certainly appreciate 'nice' wood but would love to be able to make something with it. Does that house still exist I wonder? 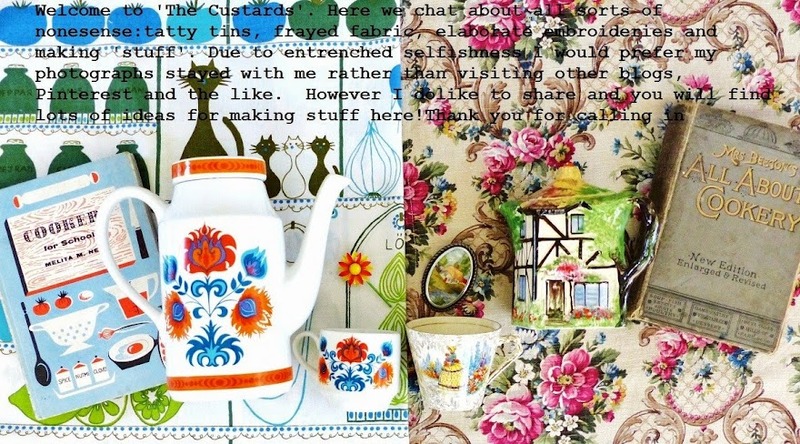 D have just noticed those teeny tiny dolls in your spiffing new header photo, do they have crocheted tiny dresses...? Pleeeeeze do tell me all about them. I love. ~ Ooh what a treat, Jenny, seeing all your beautiful collections! The best homes are those that have evolved through time, through love and hard work and collecting of those items that mean so much to us....Just beautiful! Ah dear Maria - thank you for your kind words. This home is still evolving (just had some radiators moved....). I have been watching Mr Selfridge - only with half an eye (not sure what the rest of eye is doing! )....cannot really find my way in. Not as good as I hoped but as always I like looking at the costumes...shallow that way! I am so jealous, I love Arts and Crafts but also of your beautiful front door. Thank you dear Cass - it is a nice gate to 'tra la la' through indeed! 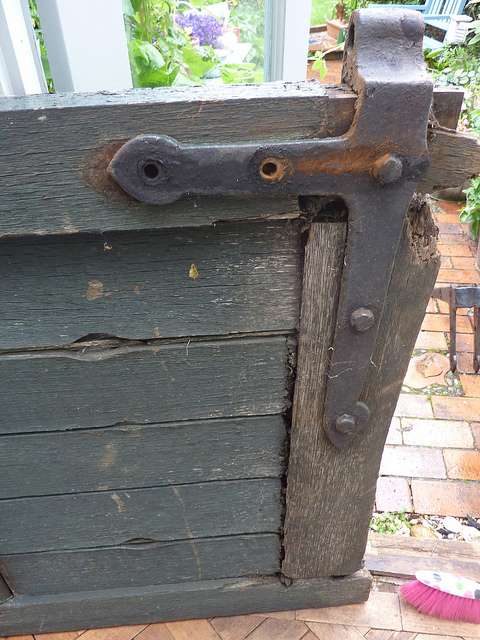 like yours.... Love your gate you have restored really well. Oh Jenny, I just love hearts! I particularly like the little chair (I have an old chair with a heart cut out, it was left to me by a lovely old lady) and the mirror ... but most of all I love the gate! It's like something from a fairy tale, perhaps from Snow White or leading to Hansel and Gretel's cottage in the woods. 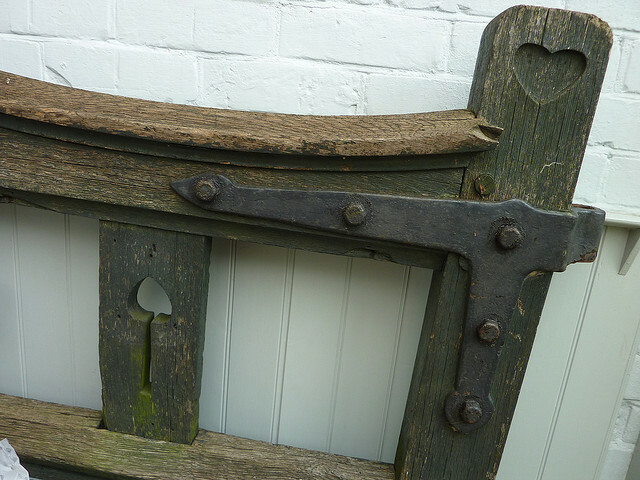 Lovely post and thank you for popping over to Thriftwood! I love the arts and crafts period too. 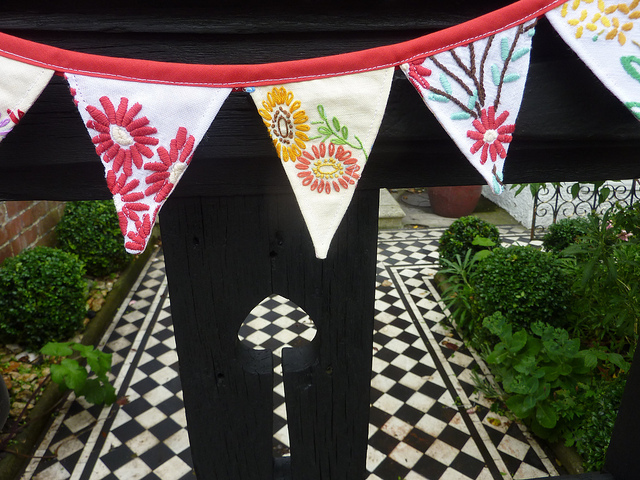 Love the wallpaper behind your umbrella stand and your front path and your bunting, I could go on and on! Thank you Gill - you are too kind dear. If you could see round the corner the truth would be revealed! I bought deco tea sets and strange vases when I was 15. I sat in bus stops knitting....I think it scared the boys away, a good idea at the time. Now married with 3 children in crafting and chaos. Your words are wise and your collections of things delightful. Dear JaneBean - maybe it is a phase that we all have to go through - our own rite of passage! I think it's wonderful that your home has a "theme". And hearts in so many different places! I echo The Vintage Gardener with your gate and bunting and wallpaper behind the copper umbrella stand. Postman not too fond of our very, very small letterbox though! You are not alone - every home I go past that has a light on I want to have a look round! Wow, I love all your treasures you have collected over the years, you must have such an eye of spotting such beautiful things! It's difficult to choose a favourite - the gate, the umbrella stand ,(I love the wallpaper behind it too) or those lovely art and crafts tiles! did you recognise those beach huts? Cold by the sea at the moment do you think? Hi Jenny, I am sooo glad that you take the time to write new blogs.They are always so fab and full of such covetable items.For the amount of stuff you have I feel sure that you are an estate agent and you go around taking snaps of beautiful things and passing them off as yours! !Isn't it odd how popular certain types of wallpaper are?!!! !Eagerly awaiting the next installment.Warm Rgeards Pam. Dearest Pam - I have just posted a message to try and put your mind at ease as to where I live - it made me laugh anyway! Perhaps our paths crossed sometimes in London! Yes - the squashed heart is particularly appealing I think. Hearts Galore Jenny! Each is more wonderful than the one before. A lifetime of collecting has brought you such joy. Thank you for sharing it with us. Love Hubby's hard work on the gate, though the dining room cupboard is just pipped at the post as my fav,by your gorgeous umbrella stand,lovely. Bring on the Arts & Crafts...I'll never tire of it! You have such wonderful things! I'm more than a little bit in love with your gate and am now coveting it, even though we have nowhere that a gate could go at all at the front of our house.